Lately I have seen astronomical pricing for tickets to Australia and Asia (If it has a flight on DL metal). JFK-SYD is running around 930K in Delta One and now I find JFK-SYD-DPS at 1,000,000 sky miles (Delta One and Garuda ECONOMY!!!). Have you ever seen it that high before? No other Skyteam airline is showing up on my searches for different dates. I Flew JFK-CAN-DPS last year Business for 160K miles on China Southern and Garuda. 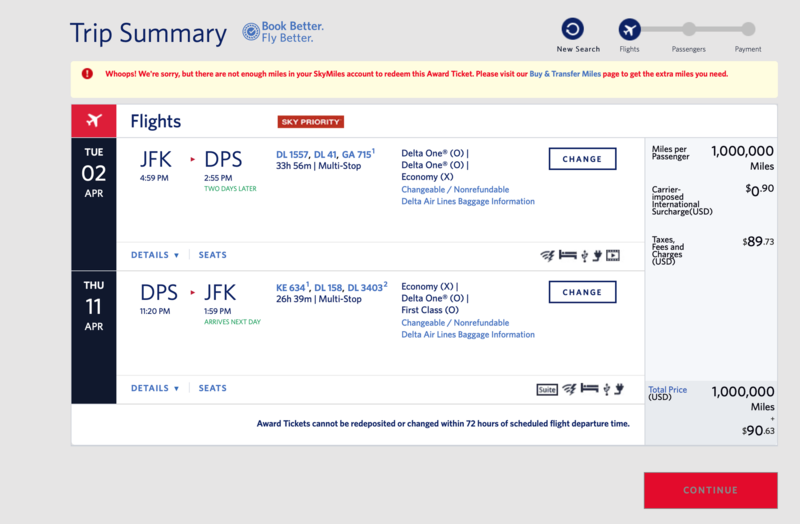 A few years ago, I flew JFK-ICN-SYD in Business Korean Air for 220K last minute, now I can't find any Skyteam airline on Delta.com, its only Delta flights that show to SYD. Obviously its extremely cheaper to fly a sky team flight rather than on DL metal. The lowest price I have found was 615K leaving Sat March 23 to Monday March 25...oh yeah the flight arrives March 25 so that price is for a turn! When I tweet delta, they can only see Delta metal flights and tell me there are no flights available on sky team eg: China eastern, China Southern, Garuda to DPS. I remember there used to be an international travel desk and you could use them to string together a trip, but I heard that has been long gone. I used them a few times many years ago to do difficult round the world trips. Oh Crazy thing, I have found a JFK-SYD for 74K in Economy. Skymiles are not completely worthless, but they are not good for long haul flights that they sell for top dollar. If I were you, I'd look into cash fares to DPS on MU, and award flights between DPS and Syd. You need to look at wholly partner operated awards. However most times you will need to call to do that. Online will usually try and force DL metal and routing as much as possible. If people want to play the game here I'll ask that they post the fare rule code, to see if origin to destination is a single fare or multiple fare components. That can be found at the changeable/nonrefundable hyperlink on the reservation & price screen, and then by clicking FARE RULE SUMMARY. Yesterday I was looking at a business DTW-(LAX)-SYD-(LAX)-DTW and it priced at a princely 930K, with a single fare FARE CODE - CSY4650 each way. That was the lowest pricing throughout December. I suspect the OP's example to DPS is a combination of two fares in each direction, maybe a CSM700 as JFK-SYD + SYD-DPS. I never followed up as i switched airlines the next week. I was trying to get my family to Hawaii for a family vacation and that single change just extended it out by like 3 years. Lately I have seen astronomical pricing for tickets to Australia and Asia (If it has a flight on DL metal). JFK-SYD is running around 930K in Delta One and now I find JFK-SYD-DPS at 1,000,000 sky miles (Delta One and Garuda ECONOMY!!!). Be willing to fly VA on the final outbound segment and save 130K miles..